Meeting The Complete Gamer, Bob Gibson — LIFE Arts Inc.
After months of anticipation the day arrived for everyone involved in the creative process and creation of the Complete Gamer Song to meet the legendary Bob Gibson, former pitcher for the St. Louis Cardinals. Gibson played for the Cardinals for 19 years from the age of 21, eventually retiring at 40 years old. The original plan was to introduce the Complete Gamer song and award to Bob Gibson on the field before the first pitch. Unfortunately this had to be put on hold due to the weather. A more intimate award ceremony between the L.I.F.E Arts students and Bob Gibson was able to take its place, along with a question and answer session. Surprisingly, a sense of calmness filled the room instead of the anticipated nervous jitters. The students were mostly excited to ask Gibson questions that they had prepared for months. One student asked Bob Gibson what he thought about the Complete Gamer song, which was in the style of rap. "I thought it was wonderful," said Gibson "I don’t know much about rap, because I'm old, but I asked my son was it good and he said it was very good." "I think you guys put a lot of work into it and I couldn’t be happier." Everyone then had the opportunity to ask their questions, and they began spitting off like wildfire. Q: How does it feel be commemorated by the Cardinals all these years later?" A: "It feels great to be honored. I was the first black player to play baseball and basketball at Creighton University. I played in little towns in Nebraska as the only black person. It was quite an experience. (in life) You must learn to lose the animosity to continue to go forward. I started off in the housing projects, I went through some rough times, but times are good now. When I first came to St. Louis it was difficult to find a decent place to live. I've seen the city go from nowhere to where it is now. It has a long way to go but it has come a long way, and I've been able to see it." Q: Theoretically, if other songs were made about you what milestones would you like to be highlighted? A:" I would have to sit down and think about it, you guys pretty much captured everything in your song, all the big milestones." Q: If it wasn’t a rap song what genre of song would you like to be made about you? A: "I'm a huge jazz fan." Q: What kind of music did you listen to, to get you hyped up for a game? A: "Well, I love all kinds of music, especially jazz but usually the game was enough to get me hyped. I didn’t need anything extra." Q: What was the biggest takeaway you learned playing for the Cardinals that you kept for the rest of your life? A: "I learned how to interact with people, the more people you encounter the more you learn about life. It's about learning why people are the way they are. Its not all about you, sports forces you to meet other people from all walks of life." A:" I want to be known as a person who gave 100% of myself towards what I loved, the driving force for me was always trying hard." 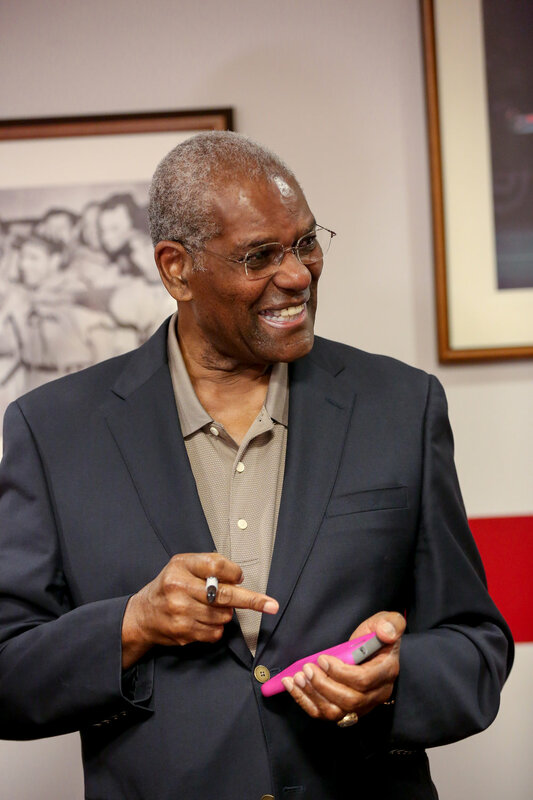 Bob was then presented with a commemorative bottle of wine, engraved with the words Complete Gamer Bob Gibson. "Another thing sports taught me," Gibson said jokingly when presented with the commemorative bottle, "was drinking some of the finer things in life." Zach, who plays Gibson in the Complete Gamer music video took the opportunity to let Gibson know how much he inspired him. "It was an honor, I used to mock your style playing t-ball growing up, it was amazing being you for a day." The final question asked of Gibson was "what would you say to someone to help them push through hardships in any avenue?" "Try to be the best that you can possibly be." Gibson said, "I strived to be the best, I didn’t get there but I sure tried. I had a brother who expected me to be better, when you grow up and you have someone pushing you it inspires you to be better." he goes on to say, "It takes a lot of hard work, it’s a cliché that says - you can do whatever you want to do- well you can't really do whatever you want to do, but if you put in a lot of work your chances are a lot better."